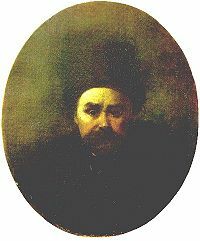 Taras Hryhorovych Shevchenko (Ukrainian: Тарáс Григóрович Шевчéнко) (March 9 [O.S. February 25] 1814 – March 10, [O.S. February 26] 1861) was a Ukrainian poet, artist and humanist. His literary heritage is regarded to be the foundation of modern Ukrainian literature and, to a large extent, the modern Ukrainian language. Shevchenko also wrote in Russian and left many masterpieces as a painter and an illustrator. Born into a serf family in the village of Moryntsi, of Kiev Governorate of the Russian Empire (now in Cherkasy Oblast, Ukraine) Shevchenko was orphaned at the age of eleven. He was taught to read by a village precentor, and loved to draw at every opportunity. Shevchenko went with his Russian aristocrat lord, Pavel Engelhardt, to Vilna (Vilnius, 1828–1831) and then to Saint Petersburg. Engelhardt noticed Shevchenko's artistic talent and apprenticed him in Vilna to Jan Rustem, then in Saint Petersburg to Vasiliy Shiriaev for four years. There he met the Ukrainian artist Ivan Soshenko, who introduced him to other compatriots such as Yevhen Hrebinka and Vasyl Hryhorovych, and to the Russian painter Alexey Venetsianov. Through these men Shevchenko also met the famous painter and professor Karl Briullov, who donated his portrait of the Russian poet Vasily Zhukovsky as a lottery prize; the proceeds were used to buy Shevchenko's freedom on May 5, 1838. He began writing poetry while he was a serf and in 1840 his first collection of poetry, Kobzar, was published. Ivan Franko, the renowned Ukrainian poet in the generation after Shevchenko, praised the freshness of the compilation: "[Kobzar] immediately revealed, as it were, a new world of poetry. It burst forth like a spring of clear, cold water, and sparkled with a clarity, breadth and elegance of artistic expression not previously known in Ukrainian writing." Gypsy Fortune Teller. 1841. Oil on canvas. Winner of the 1841 Silver Medal at the Imperial Academy of Arts. In 1841, the epic poem Haidamaky was released. 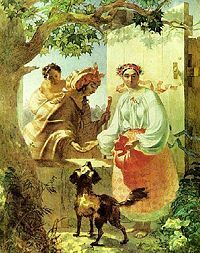 In September of 1841, Shevchenko was awarded his third Silver Medal for The Gypsy Fortune Teller. Shevchenko also tried his hand as a playwright. In 1842, he released a part of the tragedy Nykyta Hayday and in 1843 he completed the drama Nazar Stodolya. In 1844, distressed by the condition of Ukraine in the Russian Empire, Shevchenko decided to capture some of his homeland's historical ruins and cultural monuments in an album of etchings, which he called Picturesque Ukraine. On March 22, 1845, the Council of the Academy of Arts granted Shevchenko the title of an artist. He again travelled to Ukraine where he met the historian, Nikolay Kostomarov and other members of the Brotherhood of Saints Cyril and Methodius, a political society dedicated to the political liberalization of the Empire and transforming it into a federation-like polity of Slavic nations. Upon the society's suppression by the authorities, Shevchenko was arrested along with other members on April 5, 1847. Although he probably was not an official member of the Brotherhood, during the search his poem "The Dream" (Сон or "Son") was found. This poem criticized imperial rule, personally attacked Emperor Nicholas I and his wife Alexandra Feodorovna, and thus was considered politically inflammatory; of all the members of the dismantled society Shevchenko was punished most severely. Shevchenko was sent to prison in Saint Petersburg. He was exiled as a private with the Russian military Orenburg garrison at Orsk, near Orenburg, near the Ural Mountains. Tsar Nicholas I, confirming his sentence, added to it, "Under the strictest surveillance, without a right to write or paint." With the exception of some short periods of his exile, the enforcement of the Tsar's ban on his creative work was lax. The poet produced several drawings and sketches as well as writings while serving and traveling on assignment in the Ural regions and areas of modern Kazakhstan. But it was not until 1857 that Shevchenko finally returned from exile after receiving a pardon, though he was not permitted to return to Saint Petersburg but was ordered to Nizhniy Novgorod. In May of 1859, Shevchenko got permission to move to his native Ukraine. He intended to buy a plot of land not far from the village of Pekariv and settle in Ukraine. In July, he was arrested on a charge of blasphemy, but was released and ordered to return to Saint Petersburg. 1939 Soviet monument to Taras Shevchenko in Kiev, Ukraine, is located across the Kiev University that bears the poet's name. 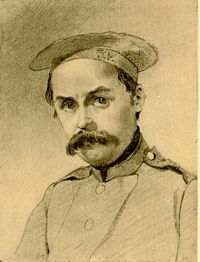 Taras Shevchenko has a unique place in Ukrainian cultural history and in world literature. His writings formed the foundation for the modern Ukrainian literature to a degree that he is also considered the founder of the modern written Ukrainian language (although Ivan Kotlyarevsky pioneered the literary work in what was close to modern Ukrainian at the end of the eighteenth century.) Shevchenko's poetry contributed greatly to the growth of Ukrainian national consciousness, and his influence on various facets of Ukrainian intellectual, literary, and national life is still felt to this day. Influenced by Romanticism, Shevchenko managed to find his own manner of poetic expression that encompassed themes and ideas germane to Ukraine and his personal vision of its past and future. 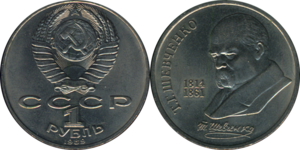 Commemorative coin issued in the USSR in 1989 on his 175th anniv. His influence on Ukrainian culture was immense, so much so that the Soviets felt the need to appropriate his legacy for their own purposes. During Soviet times, the official position was to downplay strong Ukrainian nationalism expressed in his poetry, suppressing any mention of it, and to put an emphasis on the social and anti-Tsarist aspects, that is, to Class struggle within the Russian Empire. Shevchenko, who himself was born a serf and suffered tremendously for his political views in opposition to the established order of the Empire, was presented in the Soviet times as an internationalist who stood up in general for the plight of the poor classes exploited by the reactionary political regime rather than the vocal proponent of the Ukrainian national idea. 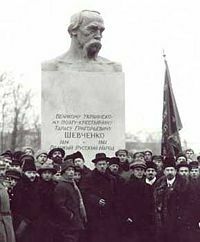 The ceremonial opening of the monument by the Latvian sculptor Janis Tilbergs to Taras Shevchenko in Petrograd (Saint Petersburg) on December 1, 1918. The inscription says: "To the great Ukrainian poet-peasant T. G. Shevchenko (1814 - 1861) from the great Russian nation." The plaster monument existed for only eight years due to the deterioration of the material in the open air. It was planned to be replaced by a bronze version, which never happened. There are many monuments to Shevchenko throughout Ukraine, most notably at his memorial in Kaniv and in the center of Kiev, just across from the Kiev University that bears his name. The Kiev Metro station, Tarasa Shevchenka, is also dedicated to Shevchenko. 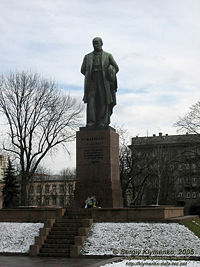 Among other notable monuments to the poet located throughout Ukraine are the ones in Kharkiv (in front of the Shevchenko Park), Lviv, Luhansk and many others. Outside of Ukraine, monuments to Shevchenko have been put up in several location of the former Soviet Union associated with his legacy, both in the Soviet and the post-Soviet times. The modern monument in Saint Petersburg was erected on December 22, 2000, but the first monument (pictured) was built in the city in 1918 on the order of Lenin shortly after the Great Russian Revolution. There is also a monument located next to the Shevchenko museum at the square that bears the poet's name in Orsk, Russia (the location of the military garrison where the poet served) where there are also a street, a library and the Pedagogical Institute named to the poet. There are Shevchenko monuments and museums in the cities of Kazakhstan where he was later transferred by the military: Aqtau (the city was named Shevchenko between 1964 and 1992) and nearby Fort Shevchenko (renamed from Fort Alexandrovsky in 1939). 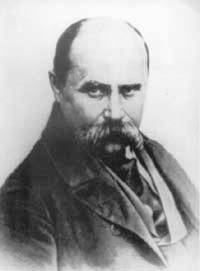 After Ukraine gained its independence in the wake of the 1991 Soviet Collapse, some Ukrainian cities replaced their statues of Lenin with statues of Taras Shevchenko and in some locations that lacked streets named to him, local authorities renamed the streets or squares to Shevchenko, even though these sites usually have little or no connection to his biography. These memorials testify, perhaps, to a greater spirit of patriotism than historical interest. There is also a monument in Tipperary Hill in Syracuse, United States, a park named after him in Elmira Heights, NY and a street named after him in New York City's East Village. The town of Vita in Manitoba, Canada was originally named Shevchenko in his honor. There is a Shevchenko Square in Paris located in the heart of the central Saint-Germain-des-Prés district. The Leo Mol sculpture garden in Winnipeg, Manitoba, Canada, contains many images of Taras Shevchenko. A two-ton bronze statue of Shevchenko, located in a memorial park outside of Oakville, Ontario was discovered stolen in December 2006. It was taken for scrap metal; the head was recovered in a damaged state, but the statue was not repairable. In 2007, monuments to Shevchenko were erected in Tbilisi, Georgia and in Budapest, Hungary. —Taras Shevchenko, 25 December 1845, Pereiaslav. Translated by John Weir Toronto, 1961. English pop group New Order released a live video in 1983 entitled "Taras Shevchenko". The concert was recorded in the Ukrainian National Home in New York City, and featured the famous self-portrait of 1840 (as shown above) on its cover. In 2001 it was re-released on a DVD called 316 (DVD containing a 1998 concert as well as the before-mentioned Taras Shevchenko recording). All links Retrieved June 12, 2008. ↑ (Russian)Paola Utevskaya, Dmitriy Gorbachev, «He could have understood Picasso himself», Zerkalo Nedeli, July 26 - August 1, 1997. ↑ (Russian)Historical page of Orsk. ↑ Catherine Wanner. Burden of Dreams. (Penn State Press, 1998. ISBN 0271017937)Burden of Dreams: History and Identity in Post-Soviet UkraineGooglebooks.com. This page was last modified on 16 November 2015, at 17:09.